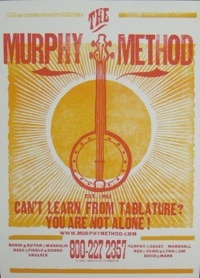 Limited Edition Hatch Show Print Poster: Designed by one of Casey Henry's banjo students, this first-ever Murphy Method poster is a must have for any TMM devotee! If you know someone who has absolutely everything we've ever put out, get them this! Each unique poster is hand-printed on an old-fashioned letterpress. It's brand new and will only be available for a short time. It ships in a tube, and the shipping charges are included in the price. (Sales tax will be added if you live in Virginia.) Measures approx. 13 1/2 x 19 inches.